"Inside each of us is a natural-born storyteller, waiting to be released." I know without a doubt that I was born to be a storyteller. As far back as I can remember I wanted to write, tell stories and play with colours. Like everyone else, I think we come into the world knowing what we really want to do and as children we call it playing. Unfortunately when we get older we are told that we have go to school and become serious. Little by little there is less time to play and to do the things we love. We are told to put away our box of crayons and put our mind to work. So we set aside our creative pursuits and go towards the serious side of life silently telling ourselves that someday we will have more time to get back to the fun creative stuff like painting, music, writing, woodworking, stained glass, sewing, knitting, dancing and chasing butterflies. Unfortunately many women never find the time to get back to doing what they loved because of a multitude of responsibilities, reasons and excuses. ​I remember as a young child filling copies with words about the people I knew. It was fun and I thought it was all good. I would draw the people's pictures and even though I knew that my drawings needed a little work, I didn't let it stop me. My greatest pleasure was to have pens, pencils, crayons, copies, books and a quiet place to sit and fill the pages. I still feel the same way today. When I went to school, I learned that I had to listen and do what they told me. The worst thing ever, was that I had to think about things like arithmetic. It was boring but I had to pass my exams to prove that I was smart enough to get to the next grade. As children we are programmed to be constantly aware of the dreaded fear of failure, so we spend our lives trying to avoid it, which limits our passions and creative potential. So my storytelling and writing got set aside because of my many adult responsibilities and my dreaded fears of failure. Yet I knew that I would find my way back to it someday, because that is who I was, as real and necessary to my well being as walking and talking. On the most challenging days of my life, it was the thought of writing that helped me to deal with everything. ​And so here it is, 2019 and I know that I am more than half way through my life. How strange it is to think of myself as an older woman... what the hell happened? I know that I am not a great writer... actually, far from it. I know I will never be a Jane Austin, nor a Kate Morton, but that is not the reason I write. I accept the fact that I will make a million mistakes but I know that I will get better with every word and sentence that I write. And yes I know that I will have to face a writers worst nightmare.... the critics! It really is a tough world out there for writers which is why so few ever actually write. Fear of judgement in anything, crushes the dreams of too many people. It makes no sense that a reader will get personally offended if a word is misspelled or a grammar mistake shows up in a 100 000 word book. Somehow writers are supposed to be perfect, in total command of their written work, with a magic touch that pours out perfect words and sentence structures unto a blank page. The reality is, writers like everyone else are not perfect and a misspelled word is not an intentional mistake aimed to insult the reader's intelligence. Doctors make mistakes and the consequences are much more serious. I have invested in an amazing collection of books on how to write books. I bought them through the years to help me put words on paper. I tried to follow all of their advice, until I finally realised that reading books on how to write, stopped me from actually writing. There were just too many rules. If you look on Amazon's how to write category, you will find thousands of books on the subject. The mere fact that there are so many people out there telling you how it has to be done, is enough to overwhelm and discourage most people from writing. And when you stop to think about, it is only their opinion, because every rule was made by someone who had an opinion about something. But like every other challenge that I have dealt with, I have let go of my fears and the need to be perfect and I just write. I will not put any pressure on myself and get bogged down in all the so called rules of writing perfection. I will just enjoy the process of telling a story because in the end, that is what it is all about. Like the old saying goes.. " the world is a stage" so I will play the part of a writer ad a storyteller looking out over my back yard garden watching nature at its best as I write the words of my stories. ​My goal is to write a variety of 100 short stories from now till then. Then being the day the lights go out and my own story is ended. At this point I am working on my fourth tale called Remember Remember Maggie Hurd. It is an amazing story, if I say so myself, about a woman who lived with a secret in a small town on the Gaspe Coast. I have written 52 000 words and I am still writing. The 2nd was Last Winter's Snowman is a family story about the love of a child for her cold snow friend. It is available here on my Book Shelf or on Amazon Last Winter's Snowman: A Snowy Story from the Gaspe Coast. I have another one started as well which I think I will call the Watercolour Artist. It is a story that I have​ worked on for sixteen years based on the life of a woman who I believe was a gentle rebel and just happened to be a real princess by the name of Louise. I will tell you more about that one at another time. 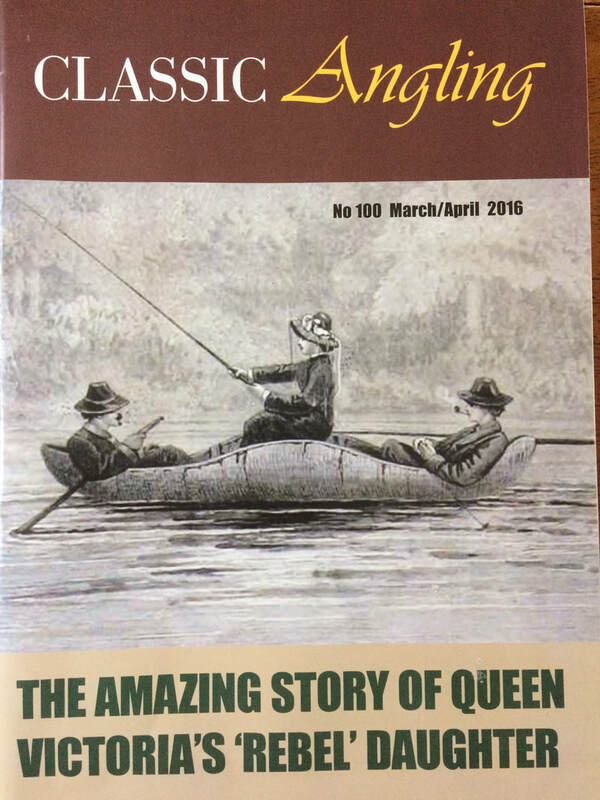 Book Shelf in a 5000 word article that I wrote as the cover story for a British magazine in 2016 You can also find it on Amazon Princess Louise Another Fishing Story from The Grand Cascapedia River. I put a picture of the magazine cover below. ​I have also added the​ video of a television program that I worked on about the Princess Louise's time on the Cascapedia as well as other stories about the fabled world renowned river. Or Come visit me at Maggies Inn where I strive to live the simple life.